Enjoy the time shopping and browsing, giving yourself at least two months to feel confident in your personal style and taste. Take note of what captures your interest and mark price and design before making the ultimate purchase. If you're going the custom route, personalizing your rings with special engravings can take up to a month to finish. 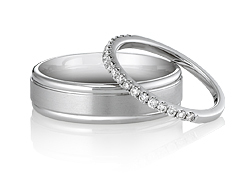 When pricing out your wedding bands, note that the average wedding band is about 3 percent of your wedding budget. Depending on the preferred band and whether or not you want some extra sparkle, the cost can quickly increase. Be true to your personal style and lifestyle!